One by one the dancers arrived on Monday. We began our Flamenco Tour with the opening night tapas reception where we shared flamenco stories over a Spanish spread. Tuesday we toured the town. We visited the Centro Andaluz de Documentación Flamenco, went on a flamenco shopping spree at Fatima's, and took a trip to the central market. That night we caught some flamenco at Tabanco El Pasaje before bed (and before the thunderstorm). On Wednesday it rained on and off making for an incredible sunset, so after class with Mercedes we just had to go up to the rooftop to watch the clouds change color. Wow. While we were up there we debriefed about the day’s classes then headed downstairs to practice palmas. 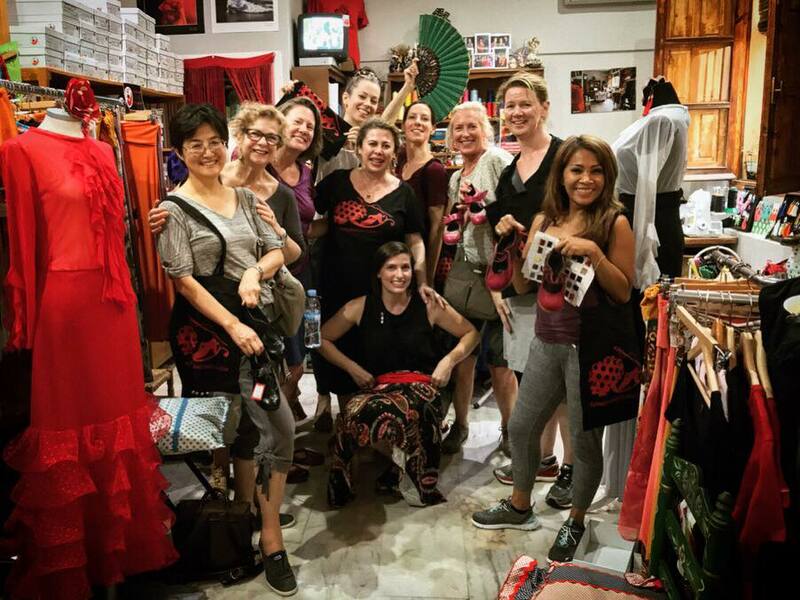 The Flamenco Tour was off to a great start! Thursday morning the sun was shining, and we were ready to go again. We headed to technique class with Mercedes then to bulerías class with Ani. Next came our siesta time where some people stayed home to eat, some went out to lunch, some rested, some walked around the town. Later on we headed to our choreography and castanets session with Mercedes. Everyone is loving the choreography, Alegrías de Córdoba with abanico. After class we went out for more shopping, and later that night some of us checked out the flamenco show down the street at Tabanco Cruz Vieja. On Friday we danced and danced again. Bulerías class ended on a very high note with Zorri, the Ambassador of Happiness, doing his thing. You can’t not smile in this man’s presence! We rewarded ourselves with fresh zumo de naranja (orange juice) in the bar with José Luís and Maribel after our afternoon workshop with Mercedes then went up to the roof to debrief and practice. We started the day off on Sunday with more Mercedes. We’re all feeling stronger after one week of classes with her. Our arms and thighs burn, but it feels so good! After class some people went to the flea market, some went out to lunch, some visited monuments like the Alcázar, and we all rested a little bit. In the afternoon we practiced bulerías in the courtyard. Our weekend on a high note with a trip to the Hammam for some relaxation and rejuvenation. By the way, can you believe that last night was the first night I’ve slept with an acutal blanket? Until now I’ve slept only with a sheet and a light bedspread. The weather has been amazing! Stay tuned for an update on the second week of the tour. In the meantime, follow me on Instagram to see LOTS more photos. And, if you’d like to know more about what happens during the Flamenco Tour to Jerez. check this out. I'll leave you with this video of Niño de la Fragua and Manuel Valencia performing bulerías last Saturday at the peña. Olé.